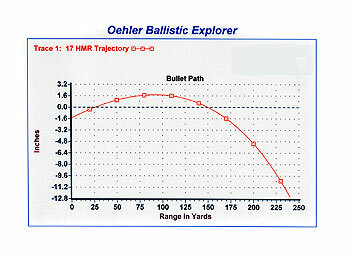 Q: What do you think is a good zero to have for a .17 HMR rifle? I was thinking of 150 yards. How high would I be at 100 yards to have a 150 yard zero? Have you shot the .17 HMR at extended ranges, say beyond 200 yards? What were the results? A: I think a good zero to have for a .17 HMR is exactly 100 yards. If you sight your rifle so that your bullets hit the bullseye at 100 yards, the bullets will be 0.1 inch high at 50 yards and 2.6 inches low at 150 yards. If you want to be zeroed at 150 yards and have access to a range that is only 100 yards long, then sight the .17 HMR to be about 1.7 inches high at 100 yards.